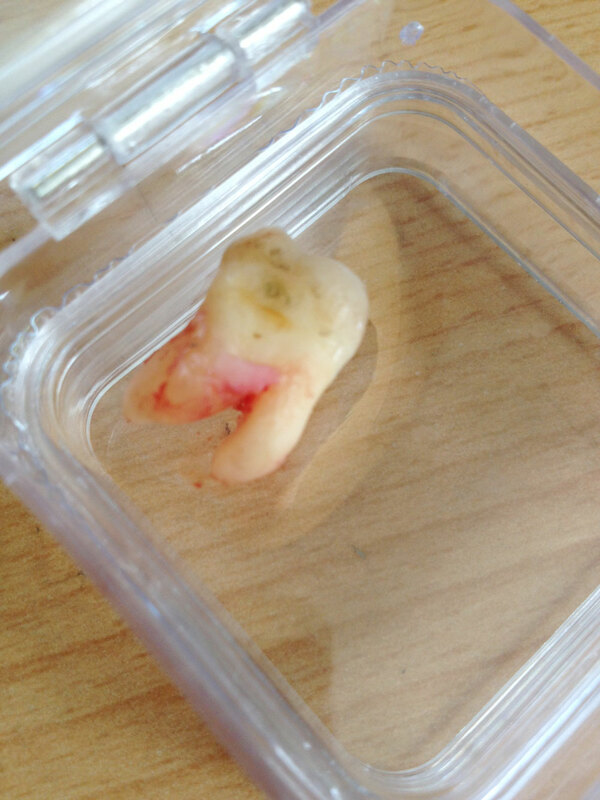 Wisdom tooth - your reign of oppression is over, thanks to a good dentist. This post is possibly not for the squeamish, in fact if you are a bit delicate then I'd recommend against scrolling down as there are some photos of teeth you might not enjoy. I even got a neat little presentation case! A couple of years ago the mystery of why my gums and the insides of my cheeks blew up like painful balloons sometimes was solved. My dentist told me that I needed my top wisdom teeth removing; because the bottom ones are growing in a different direction nothing was impeding their growth, and they were getting a bit large. Like most people I take dental advice on-board, and then kinda really mean to action the advice, but never quite get round to it. 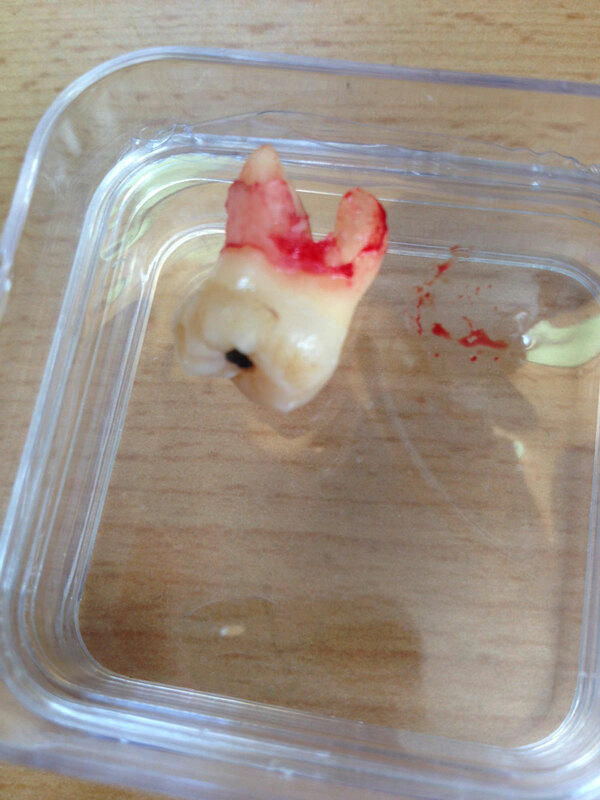 My dentist assured me that the extraction would be painless, and despite the fact this dentist has never caused me any pain what-so-ever (even although I've had repairs, fillings and root-canal surgery) getting my wisdom teeth removed never quite seemed like a priority. By the start of this month I could no longer eat properly, and if I didn't keep up my regime of painkillers the pain was almost unbearable. I was taking painkillers late at night and being woken up by acute dental pain when they wore off some time around 3am. Every night. By the time I booked myself in for the extraction I was in a considerable amount of pain 24 hours a day, with the dual-dosed paracetamol and ibuprofen only just taking the edge off. 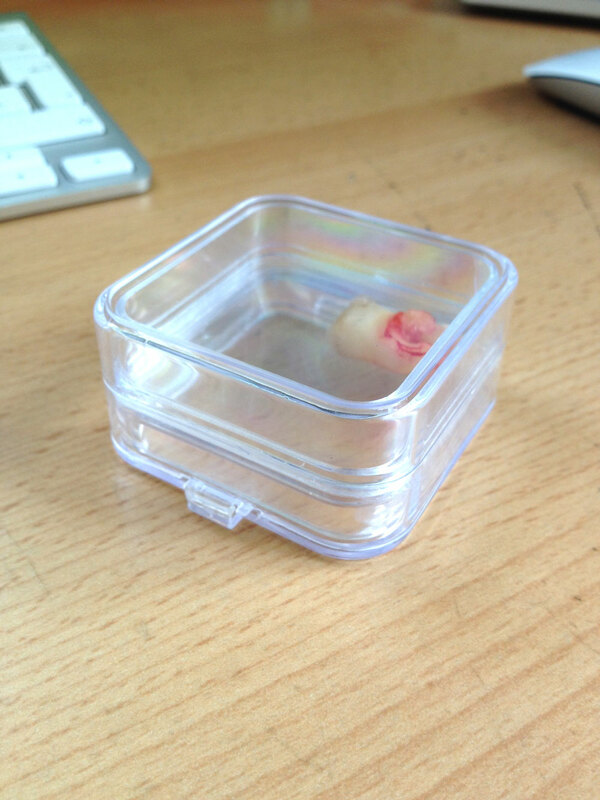 The time had come to say goodby to Mr. Lefty (only the left tooth needs to be removed at the moment). On the big day I sat in the waiting room focussing on the positive outcome of this extraction; the biggest being the ability to eat and drink without feeling electric shocks of pain ripple through my face. As soon as I was in the chair the dentist informed me that he would 'start getting me numb', and started using a mirror to look at my gums, and just as I was wondering when he was going to start the injections I tasted the anesthetic in the back of my throat. Oh my, I literally didn't feel the injections at all, that's AMAZING! My dentist took a quick x-ray and showed me the roots of the wisdom tooth on a screen in front of me, reassuring me that this helped him know which direction to apply force. Then it started. He very gently lent on my chest and warned me that I'd be able to hear some strange noises due to the fact the wisdom tooth was so close to my ear. About fifteen seconds of what I can only describe as 'mild pressure' the dentist asked me to bite my teeth together. Whyever would he ask that I pondered to myself. Then he asked me if I wanted to keep the tooth, which of course I did! I lay there waiting for whatever it was that he had just placed in my cheek to take effect, and was a bit surprised when my dentist started returning the chair to the upright position. WHAT? That was it? I was relieved I got a bit giggly! I'm writing this the day after and while I do have some discomfort it's nothing compared to the pain this damned tooth has given me for so long. Happy days! So if you're reading this because you've been putting off getting a tooth extracted then I hope I have offered you some reassurance that with a good dentist there really is nothing to fear. That's a teeny tiny filling in the top! 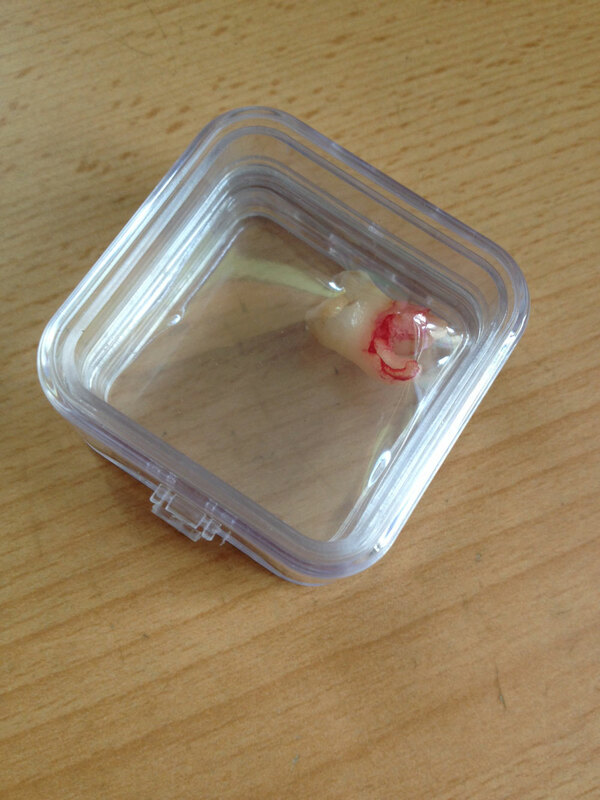 I measured the tooth with my vernier calliper and it's 20.4mm long and 12.8mm wide! Just over a year ago I stumbled upon a kickstarter campaign for a small device that appeared to be a modern version of one of those keyfobs you can whistle at when you lose your keys. The price was surprisingly low so I took a chance and invested in three Tiles (and got one free!). This morning they arrived, here are my first impressions. Kids don’t bother about nutrition being present in their meals. They just don’t bother whether the food or meal that they are consuming is healthy, or is providing them the proper required nutrition which is essential for their adequate evaluation. No, they don’t waste their time griming over such issues and rightly so. Why would they when they have their parents to worry about stuff like that. So in simple terms, if parents desire to provide their children with the proper nutrition in their meals, then they will have to pull up their stock and smarten up a bit. They have to pester their brain cells to come up with innovative ideas in providing their children the proper needed nutrition in their meals. They have to strike a balance between selecting meals which provide the much needed protein and energies as well as that which appear to their children as something tasty and which they are willing to consume or eat on a daily basis. These parents have somewhat got their work cut out, but for the sake of their children they are willing to go to any extent just to make them healthy. Eggs are a must for every breakfast meal. Fruit smoothie, such as a strawberry smoothie. Or a mango smoothie is also a very healthy and tasty way to begin a Children’s’ day. Cold milk, cereal, cornflakes etc. are also not a bad idea. Try out Waffles, French toast, pancakes (try wheat or whole-grain varieties). They are equally tasty as well as healthy. Bagel, whole-grain toast or cheese crested with puffed up English muffins is also very tasty as well as very healthy. 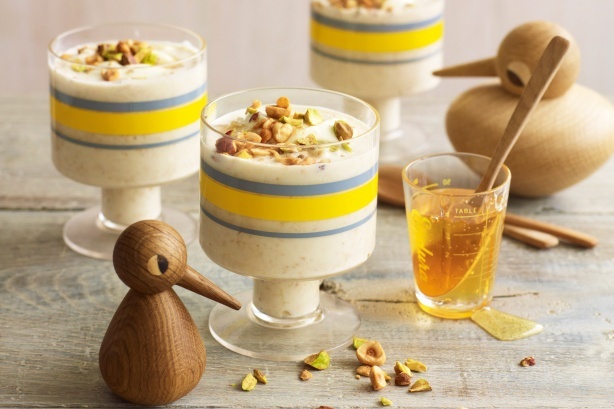 Yogurt with fruit fillings or Fruit cakes with nuts is also not bad. Banana dog with the main component being a banana, peanut butter, and whole-grain bun dressings. Taco fragmented with cheese in the tortilla, enveloped in half and then micro-ovened is also not a bad idea to serve children in the morning. Fruit and cream cheese sandwich comprising of cheese, and various fruits. Grilled cheese sandwich, or sandwich with peanut butter and jam. Like in every meal parents should also include these items in their children’s diet good health and effective nutrition. Parents must also keep in mind to include a regular dose of other pre-requisites such as a fresh dose of fruits, various dairy or milk products such as low-fat cheese, fat free milk and yogurt. They can also include in their children’s diet various green vegetables and grains. But make sure to use it in a manner that the children don’t recognize, because if there is one thing to know about children, it is that they hate green vegetables. So their parents have to use it cleverly to feed them. Following these breakfast ideas for kids will help them get the necessary proteins and nutrition in a very yummy manner.